Recently Gesture controlled Laptops or computers are getting very famous. This technique is called Leap motion which enables us to control certain functions on our computer/Laptop by simply waving our hand in front of it. It is very cool and fun to do it, but these laptops are really priced very high. So in this project let us try building our own Gesture control Laptop/Computer by combining the Power of Arduino and Python. We will use two Ultrasonic sensors to determine the position of our hand and control a media player (VLC) based on the position. I have used this for demonstration, but once you have understood the project, you can do anything by just changing few lines of code and control your favorite application in your favorite way. We have already covered few projects which combines Arduino with Python. So I assume that you have already installed Python and its serial library and have successfully tried out few basic projects like blinking LED. If not, don’t worry you can fall back to this Arduino-Python Led Controlling tutorial and get along with it. So make sure you have installed Python and pyserial library before proceeding. The concept behind the project is very simple. We will place two Ultrasonic (US) sensors on top of our monitor and will read the distance between the monitor and our hand using Arduino, based on this value of distance we will perform certain actions. To perform actions on our computer we use Python pyautogui library. The commands from Arduino are sent to the computer through serial port (USB). This data will be then read by python which is running on the computer and based on the read data an action will be performed. To control the PC with Hand Gestures, just connect the two Ultrasonic sensors with Arduino. We know US sensor work with 5V and hence they are powered by the on board Voltage regulator of Arduino. The Arduino can be connected to the PC/Laptop for powering the module and also for Serial communication. Once the connections are done place them on your monitor as shown below. I have used a double side tape to stick it on my monitor but you can use your own creativity. After securing it in a place we can proceed with the Programming. The Arduino should be programmed to read the distance of hand from the US sensor. The complete program is given at the end of this page; just below I have given the explanation for the program. If you are new to Ultrasonic sensor, just go through Arduino & Ultrasonic Sensor Based Distance Measurement. By reading the value of distance we can arrive at certain actions to be controlled with gestures, for example in this program I have programmed 5 actions as a demo. Action 1: When both the hands are placed up before the sensor at a particular far distance then the video in VLC player should Play/Pause. Action 2: When right hand is placed up before the sensor at a particular far distance then the video should Fast Forward one step. Action 3: When left hand is placed up before the sensor at a particular far distance then the video should Rewind one step. Action 4: When right hand is placed up before the sensor at a particular near distance and then if moved towards the sensor the video should fast forward and if moved away the video should Rewind. Action 5: When left hand is placed up before the sensor at a particular near distance and then if moved towards the sensor the volume of video should increase and if moved away the volume should Decrease. Let us see how the program is written to perform the above actions. So, like all programs we start with defining the I/O pins as shown below. The two US sensors are connected to Digital pins 2,3,4 and 5 and are powered by +5V pin. The trigger pins are output pin and Echo pins are input pins. The Serial communication between Arduino and python takes places at a baud rate of 9600. We need to calculate the distance between the Sensor and the hand each time before concluding on any action. So we have to do it many times, which means this code should be used as a function. We have written a function named calculate_distance() which will return us the distance between the sensor and the hand. Inside our main loop we check for the value of distance and perform the actions mentioned above. Before that we use two variables distL and distR which gets updated with current distance value. You can now read over the complete code for this gesture controlled PC given at the end of the page and try understating it as an whole and then copy it to your Arduino IDE. The python program for this project is very simple. We just have to establish a serial communication with Arduino through the correct baud rate and then perform some basic keyboard actions. The first step with python would be to install the pyautogui module. Make sure you follow this step because the program will not work without pyautogui module. Step 2: Inside your python directory use the command python –m pip install –upgrade pip to upgrade your pip. Pip is a tool in python which helps us to install python modules easily. Once this module is upgraded (as shown in picture below) proceed to next step. Step 3: Use the command “python –m pip install pyautogui” to install the pyautogui module. Once the process is successful you should see a screen something similar to this below. Now that the pyautogui module and pyserial module (installed in previous tutorial) is successful installed with the python, we can proceed with the python program. The complete python code is given at the end of the tutorial but the explanation for the same is as follows. Let us import all the three required modules for this project. They are pyautogui, serial python and time. Next we establish connection with the Arduino through COM port. In my computer the Arduino is connected to COM 18. Use device manager to find to which COM port your Arduino is connected to and correct the following line accordingly. Inside the infinite while loop, we repeatedly listen to the COM port and compare the key words with any pre-defied works and make key board presses accordingly. As you can see, to press a key we simply have to use the command “pyautogui.typewrite(['space'], 0.2)” which will press the key space for 0.2sec. If you need hot keys like ctrl+S then you can use the hot key command “pyautogui.hotkey('ctrl', 's')”. I have used these combinations because they work on VLC media player you can tweak them in any way you like to create your own applications to control anything in computer with gestures. Make the connections as defined above and upload the Arduino code on your Arduino board. Then use the python script below and launch the program on your laptop/computer. 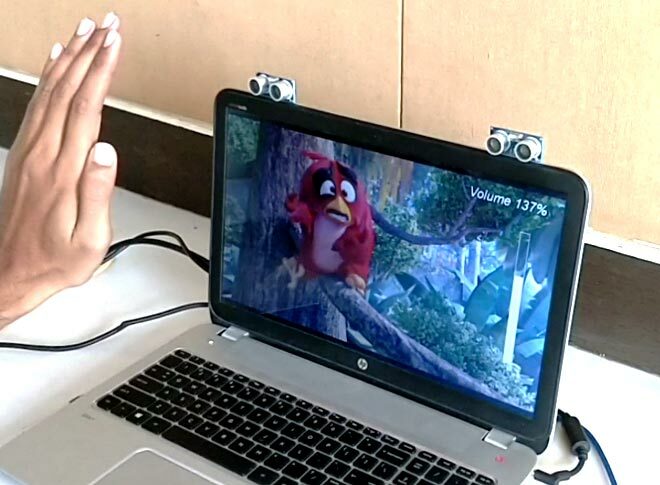 Now you can play any movie on your computer using the VLC media player and use your hand to control the movie as shown in the video given below. Hope you understood the project and enjoyed playing with it. This is just a demo and you can use your creativity to build a lot more cool gesture controlled stuff around this. Let me know if this was useful and what you will create using this in the comment section and I will be happy to know it. What are the specific materials needed for this project? You cannot control VLC player without getting your Python to work. What error are you facing while trying to run the python code? In which software should I type Python code..
Is it possible to just use Arduino and copy and paste the code? I couldn't run the python code and rest off the process. I stuck in after installing pyautogui module. can I have the same code for python 3.5 please ? Is anyone in this forum who tried the project and succeded. Sir, how would Arduino software recognize VLC media player? if i can code the program in c++ will it work? I want to use this project as a graduation project. Can you help me if you have a problem? Venkat Harish, I ran into the same problem. You need two hyphens before the upgrade argument. i can't run a python program . what should i do to overcome that error? I got everything to work. I already uploaded the arduino code and got python to work but when I try to test it with VLC it doesn't work. What could be causing my problem? bro..go to arduino app and select tools(available in header below the app name)and then select board(know ur board example arduino uno or nano etc) and back then select port(below the board option) which is like com3,com12,com13 etc know which serial is connected .for example if ur arduino port is com3 then in python code there is a line which is serial.Serial('com3',9600)..this com3 should be same. then dump the audrino code to board quickly run the python code ..i am also facing this error and now its working fine. yeah.. u selected the Arduino board and dumped the code . coming to python..,, i have installed the python 3.6.4 and installed the dependencies. now tell me how to test whether the project is working or not? after the code is being run in background, should we launch the vlc player? python indicating this error "'module' object has no attribute 'Serial'"
If we want to control ppt with hand gestures what changes we must do? Done all the same installation as mention in given link but Output is not getting only... none of the gesture is not working...in python shell output is getting as forward rewind but in VLC video is not forwarded or rewind ? My program is perfect with both arduino and Python both have been executed but there is an issue with the port I.e. it doesn't allow one to overlap each other type of. And secondly even after correctly getting the output at arduino monitor there is no changes in the video player please help! Boss i just love your idea. Never thought like this. I already have all this accessories. 3 distance sensors can make it even more accurate. I will make its gesture detection and AI more accurate I.A. I am imaging more fun with playing games like this. and moving next previous pics in slide show with swipe gesture etc. is it necessary to run python? while uploading program to board, it gives this message: Arduino: 1.8.5 (Windows 7), Board: "Arduino/Genuino Uno"
Sketch uses 3616 bytes (11%) of program storage space. Maximum is 32256 bytes. Global variables use 258 bytes (12%) of dynamic memory, leaving 1790 bytes for local variables. Maximum is 2048 bytes. have you checked if you have used the correct COM port? Respected sir Eeven i am facing the error. hope you will reply as soon as possible. just tell me that after running the python script , what we've to do? Shall we play the VLC or we have to do anything else? Yes connect the programmed arduino to computer. Check the COM port and make sure the python code has the same COM port mentioned. Thanks the project is working good . Could you help us in controlling the gallery using the same principle. Code is working , but result is printed on serial monitor , video is not operated as it should be according to code.I have use code in C.
I have uploaded the code and compiled the python code but nothing happens and power and orange light are on on the board. Check if the python code is receiving data from the arduino, i selected the wrong COM port and when corrected I got it working again!! Can i also use this for powerpoint presentation control? i got everything working.....except "vol down" and "rewind" are not working please help me!!! import pyautogui # add pyautogui library for programmatically controlling the mouse and keyboard. Some one has suggested that use python 3 instead of python2 but python 3 does not make any folder like python27 so that we can'nt install pyautogui in that. If have any suggestion for installing pyautogui in python3 please guide me. Everyone is talking about the error but no one has sollutions. I have tried to run the codes in Windiws 7 (32 bit) as wel as (64 bit). But the error is same. Install Python3.7 and intall pyseries in C:\program files\Python37-32 and also pyautogui in the same. and the run the code. It works. same error for me what have u done? I just moved from Python 2 to 3 version. It seems to be a bug with pyautogui on the old version. With 3 it is fine. Can you please guide me how to shift the python 2 to python 3. I am trying to run the code in 3 but we have installed pyautogui is installed in C:\python27. Hi Elena ! can you please guide me how to install pyautogui in python 3? Please share the steps or link. i tried to import pyautogui in shell window . it shows no error.